I promise you, this is a 20 minute project. If that. My husband left the house to pick up our kid from school down the street and by time he was back, this was finished. 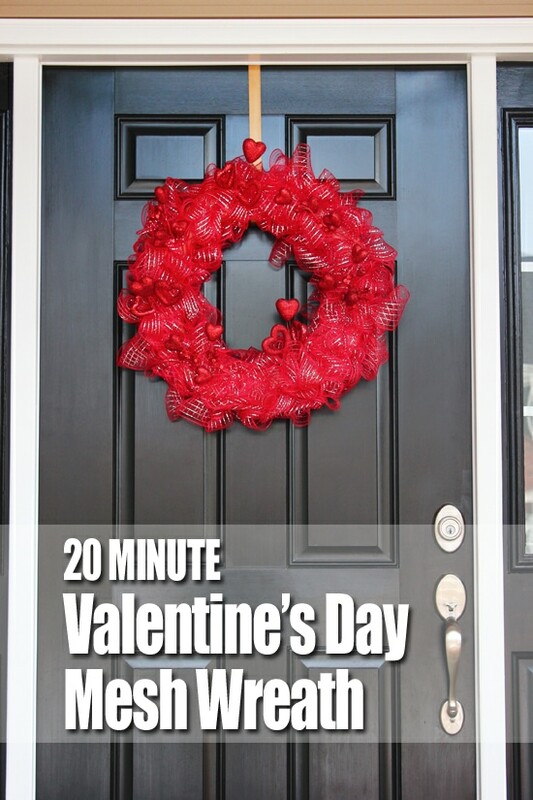 A 20 minute Valentine’s Day wreath. 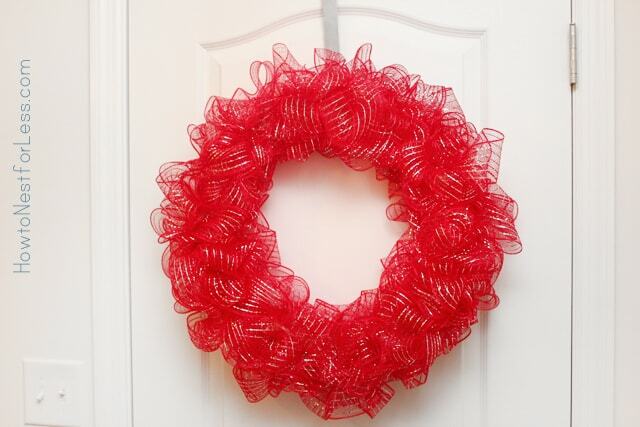 Now I must preface this by saying I’ve never made a mesh wreath before. I have no clue how to “really” make one. So if you want to call this cheating… by all means. OH, and did I mention that the mesh was on clearance? 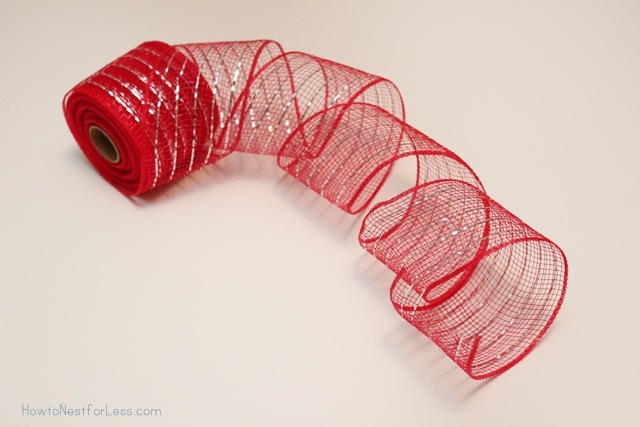 Yeah, Christmas ribbon at 80% off from Michael’s. Cheap and fast… just my style. Then grabbed it a couple loops and pinched it together. Then I pinned it to the straw wreath using a greenery pin. I did NOT cut the mesh before the next pin. Just keep pulling loops and pinning. Now since the mesh is a little see through, I did three different layers around the straw wreath form. One in the center, one along the outside of the wreath, and one along the inside of the wreath. 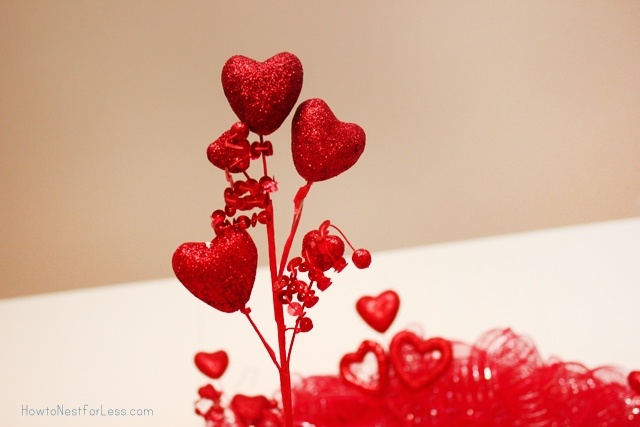 To add just a little bit of Valentine’s Day bling, I attached the spray with greenery pins as well. And BAM! 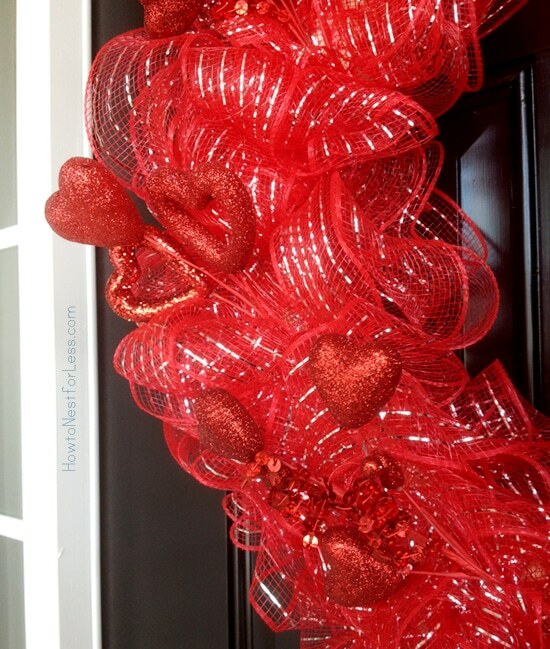 A new Valentine’s Day wreath in less than 20 minutes. Wow! That turned out great. I saw some of that ribbon on sale and just passed it by because I had no idea how to make a wreath with it. 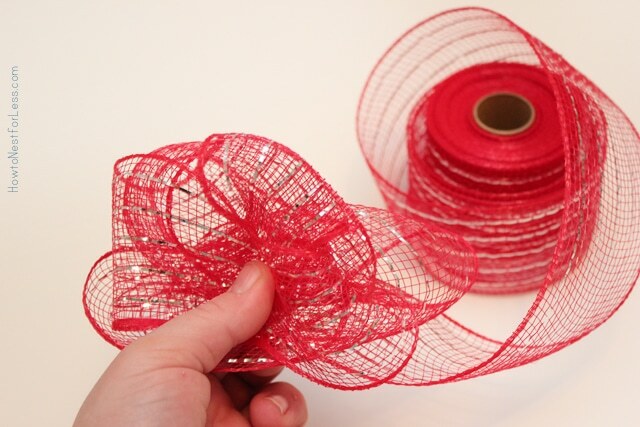 I’ll be on the lookout for the ribbon and give it a try. Nice. Very nice. Colors are vibrant. I am sure it will take me more than 20 minutes. 🙁 Thank you so very much for sharing you talent with us. Looks great. Don’t ya just love these EZ PZ projects. You’re welcome Kathy. Good luck! Super Cute! I want to cheat, too! The way I was doing it was real irritating. I won’t go into details. Love this! I am planning a rehearsal dinner with red as a primary color. I am going to try to make a few of these for some extra decor I need; then I will keep one for myself, and give one to the bride, and then have an extra! Your instructions seem simple and very clear! Thanks! You’re welcome Connie! Great idea, too. Good luck to you! What an awesome idea! 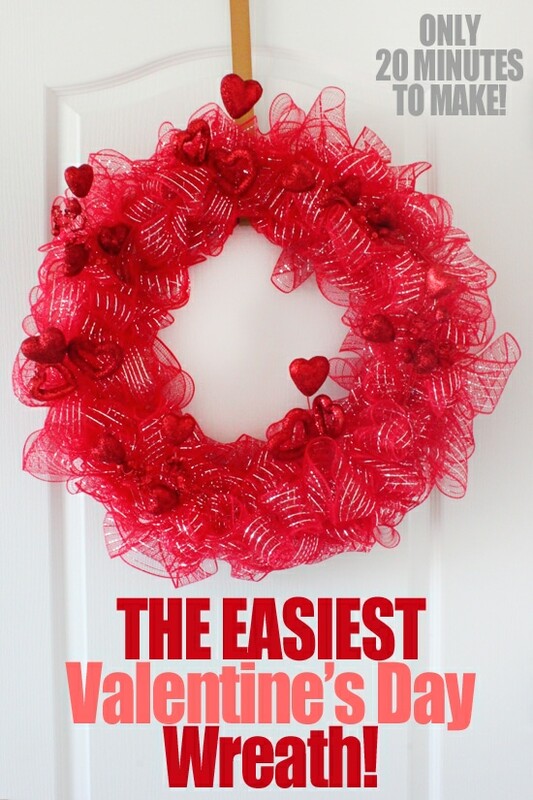 I can imagine that this kind of wreath can be made for any type of holiday. 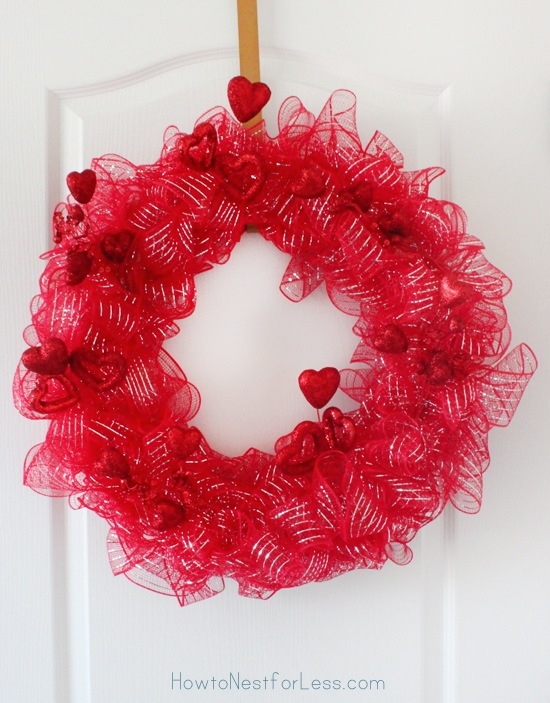 I wonder what a wreath like this in “Christmas” colors would look like? I saved it to my “Pinterest” board for future reference. You did a great job Erin! Thanks for sharing your great idea!! That is so cool and maybe easy. I’m all thumbs when I go getting crafty like that. But I may have to try it. 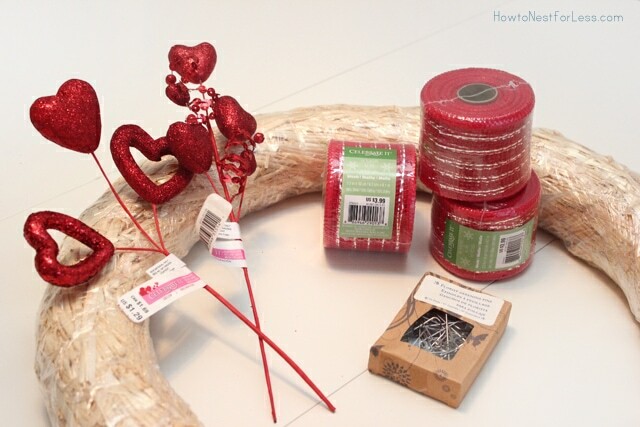 What is the width on the ribbon that you used? I think it was about 4 inches. I love the way you made the Easter wreath. 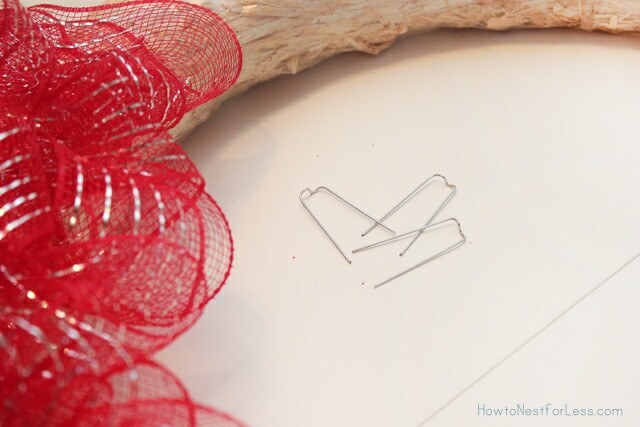 What size straw wreath did you use? I am going to make several different wreaths like that. Thanks for posting the directions. I normally use an 18 inch wreath form. Good luck with your wreaths!